The two Russian designers Alexey Goryainov and Mikhail Krymov have imagined the Sleepbox, a ‘box’ in which you can relax and rest in a calm and quiet environment, even if you’re in the middle of a bustling public place. An endless connection between two flights? Few hours to spend in an abandoned train station? Sleepbox has been the dream of all travelers who would like to take a nap without missing their connection. Sleepbox has everything a tired traveler could wish: comfy beds with automatic system of change of bed linen, dark blinds, a soundproof cabin, a closed and safe place to peacefully fall into the arms of Morpheus, a storage place for luggage, horizontal handle for clothing, and of course, an integrated alarm clock. 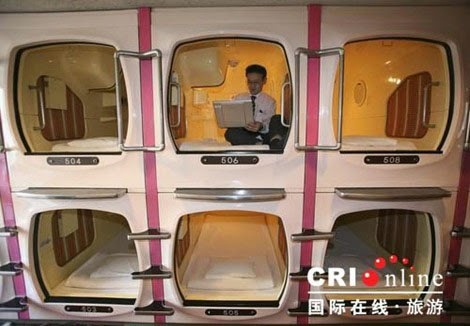 Unlike Capsule Hotels in Japan (cf. picture below, to be avoided at all cost if you’re claustrophobic), Sleepbox is relatively large, all built in an eco-friendly wood, and has a pure and cozy design. The first Sleepbox hotel has opened in Moscow in January 2013, where it is around 50 euros for one night. We can’t wait before they open these little sleeping boxes in airports, at an hourly cost maybe, we’ll assuredly be the first clients! What about you? Would you use the Sleepbox? For more information about the Sleepbox, please refer to Minimal Home website and their brochure.